PreHab Diabetes Services offers a full line of insulin pumps to meet your specific needs. These are small, computerized devices programmed to deliver insulin into the fatty tissue beneath your skin. An insulin pump replaces the need for insulin injections. A programmed dose of insulin is delivered continuously 24 hours a day, while mealtime doses can be administered with the touch of a button. Most of the insulin pumps we offer are compact – roughly the size of a deck of cards – yet accommodate a reservoir of insulin, the pumping mechanism, battery, computer chip, and a screen. They’re called external pumps because they are worn outside of the body, typically attached to a belt, waistline, or even a bra, or they can be carried in a pocket. With the exception of the Omnipod insulin pump, all other pumps are connected by thin plastic tubing to an infusion set. 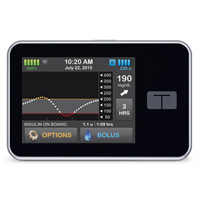 The infusion set serves as a “connector” between the insulin pump and your body. Similar to an intravenous line, it allows insulin to flow from the pump into your skin and is attached to your skin with a strong adhesive. On the underside of the infusion set is a needle housed inside a cannula, a tiny plastic tube. The needle is used to puncture the skin to insert the cannula. After insertion, the needle is removed and the cannula stays in place. 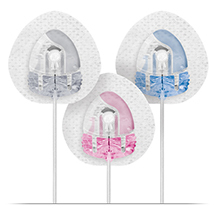 Many infusion sets come with a push-button, spring-loaded insertion device that inserts the set. 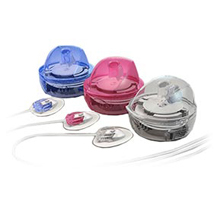 There are various types of infusion sets categorized as either angled set or straight set. Angled sets are inserted at a 30-degree angle and sit laterally under the skin, while straight sets are inserted perpendicularly at a 90-degree angle. Cannulas and needles for both types of infusion sets are available in different lengths. Infusion sets are changed every two to three days. The Omnipod insulin pump, also called a “patch pump,” is tubeless. Each “pod” contains an insulin reservoir and adheres directly to the skin, with a tiny cannula inserted just beneath the skin. There are no infusion sets or tubing involved. 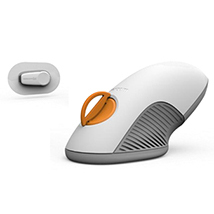 It comes with a wireless device that communicates with the pod to administer insulin.